I missed posting yesterday - but Kenny Van Hummel valiantly held on for another day, and ended up riding nearly the entire stage solo again, finishing at 34:43, 13 minutes after any other rider. He received a very nice writeup in NRC Handelblad, which avoided the condescension often seen in articles about the Tour Lanterne Rouge. An opposite example was this mean-spirited piece of snark which called his finish "off the back of the last of the laughing groups." Today, however, he was dropped again about 4 km from the start and struggled to keep within the cutoffs. Ultimately he took a few too many chances on the descents, attempting to make up time, and crashed. He incurred a knee injury severe enough to send him to the hospital and out of his first Tour de France. Bravo, Kenny, well done. We hope to see you again next year and to see you finish in Paris. You've gained a lot of fans around the world in eleven days as the Lanterne Rouge for your persistence and courage. Re-taking the spot as Lanterne Rouge of the Tour de France today is Yauheni Hutarovich (FdJ). He is firmly in last place in general classification by a 12 minute gap. 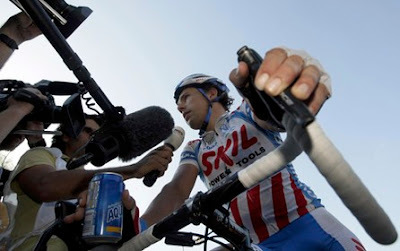 He seems well able to finish the mountains, so barring bad luck or someone else incurring some major time losses, he seems likely to finish the 2009 Tour in Paris as its final Lanterne Rouge. Interestingly, on the day before the last individual time trial, the two Fabians (Cancellara and Wegmann) finished together last for the stage at 35:59 after the stage winner. That's the way to conserve energy, all right! I probably should go put some betting money on Fabian Cancellara for tomorrow's stage win! Other withdrawals brought the peloton down to 158 by the end of stage 17 (12.2% attrition). Jens Voigt (Saxo Bank) had a gruesome crash on a fast descent in Stage 16 and was helicoptered out with some broken facial bones, concussion, and severe road rash. His helmet saved his life. During Stage 17, Cyril Dessel (Ag2R La Mondial) and Jose Angel Gomez Marchante (Cervelo) abandoned. Thanks for all your efforts, Nancy! All are well written! Yes, Kenny & Skil Shimano have won fans hearts as the Cinderella team, as Pez called them in his rest day article. They are all under contract for TdF next year & I look forward to seeing Kenny finish in 2010. I was really sorry to see Kenny. He showed extraordinary courage and determination in this tour. Nancy, just want to add "keep up the good work" on highlighting the lantern rouge. There is much more than meets the eyes, and the lantern rouge who finishes in Paris on Sunday has every reason to be proud for having completed this grueling three-week race. I have been following the exploits of the lantern rouge myself for about a decade now, and am delighted to have discovered your blog this July.